Hello there, welcome to my over fifty fashion blog. 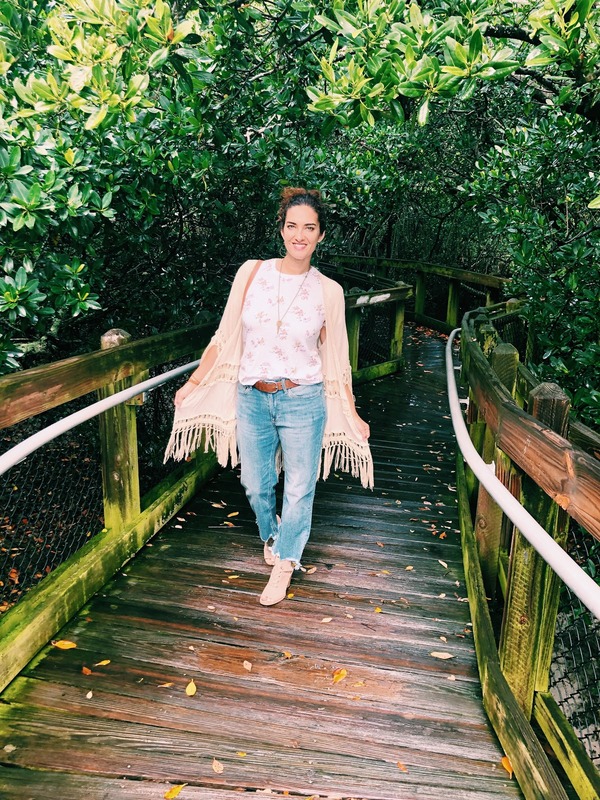 Here I share my styles, parts of my days & a little about my family life. I spent last weekend working in the garden grass cutting, shed building and generally clearing out winter residue to make way for summer excitement. We got a lot done which is just as well because this one will be a busy fun one! Saturday morning I will be having brunch with the kids for Mother's Day as we're not all free on Sunday. Saturday evening we are having a family & friends get together in rememberance of my mother-in-law - it will be an evening of celebration with lots of stories and photos being shared. Sunday we are going to a wedding with friends, I know it will be a rush as the clocks go forward here in the UK. Thankfully I know my phone will do it automatically which is just as well because I'm sure to forget to actually change my watches & clock! I've got a super emerald green lace dress that I can't wait to wear and share with you all. Look out for that post in the next few weeks as the dress is fabulous. Laying in bed a few weeks ago, my wardrobe doors were open, basically too much stuff hanging inside and out so the doors wouldn't shut - am I the only one this happens too? *thinking emoji* and this outfit was staring at me - not altogether, but the pieces were pulled out near each other - I liked how they looked so planned the outfit for my next shoot. Another caught my eye in the same way, but will be sharing that in the next month or so. 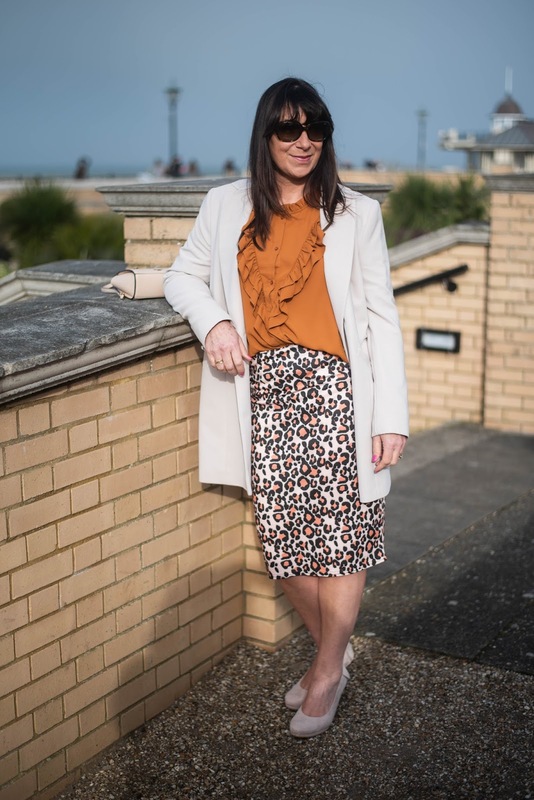 A pencil skirt is really flattering for when the weather improves, they are so comfortable to wear and always look stylish. You might recall I wore this with my daughters denim shirt which looked cool, but with a blouse and jacket it's somewhat smartened up the look making it suitable for lunch with a friend or a day of shopping. 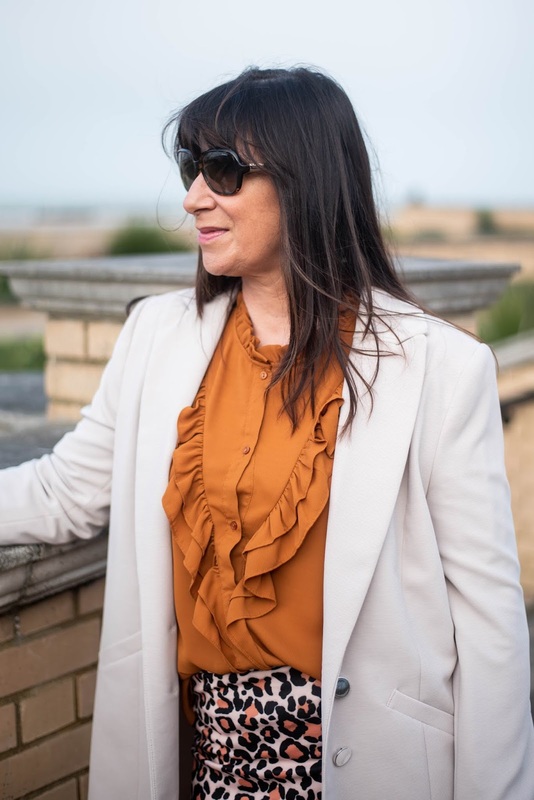 Hanging next to this rust ruffle blouse, I could see that the pinky - coral leopard design blended beautifully, just behind was this 80's style long line blazer which pulled everything together nicely. I picked the latter up in Wallis earlier this year for a bargain of £10 - having already worn it numerous times and it's not fully Spring yet! I know it's boring beige, but at least I can brighten it up if I need to! Lol You might like this similar version. 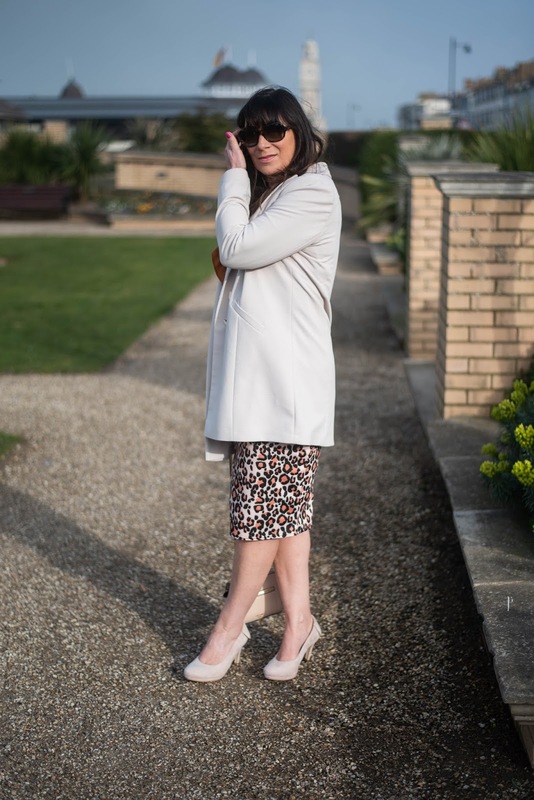 Have you spotted my super comfy Calla court shoes? They really are a dream to wear and are ideal for bunion sufferers too. Neutral beige means they can be thrown at near enough any outfit and look great. Catch some other looks I've paired them with my elegant lace dress & looking chic in my Chanel jacket. Borrowed this dainty little bag from my daughter again, so lovely to have them to share their accessories with. This is from a selection at T K Maxx, but I spotted this one that has potential! #chicandstylish #linkup time, hope you're ready to join the party! Thanks for stopping over this week, hope to see you again soon! Many hugs and kisses to Esther Ruby for these photos. Hope you're having a lovely week so far :) We finally have some cooler autumn weather - I'm even wearing jeans today! Enjoy your busy weekend! To be styled by the universe is something special indeed! I cleared out my spillage clothes from the guest wardrobe yesterday and when I saw the stuff it has stored piled on the armchair, well it gave me new respect for the capaciousness of wardrobes, and instead of shouting out " enough!" they give you outfit inspo!! Funny how we get inspired like that. I once unpacked, hung clothes on my wardrobe doors randomly and voila, an outfit. I really like your leopard print skirt and accessories. I got a pleated one for spring, from H&M. Enjoyed your post. Jacqui, this outfit is fantastic! I don’t have a leopard skirt but now I am thinking I need one! But that may make my closet pour out everywhere if I add one more thing to it! My closet door still shuts only because my husband has threatened divorce if the clothes start pouring out of it! Haha. Anyway, don’t you love when an outfit sort of accidentally comes together like that? Very cool! Love this look! I love when I see pieces hanging together that just seem to create their own outfit. Great combo!That is a pretty skirt that I am sure you can wear many things with. Love how you got inspired! That's a pretty outfit. 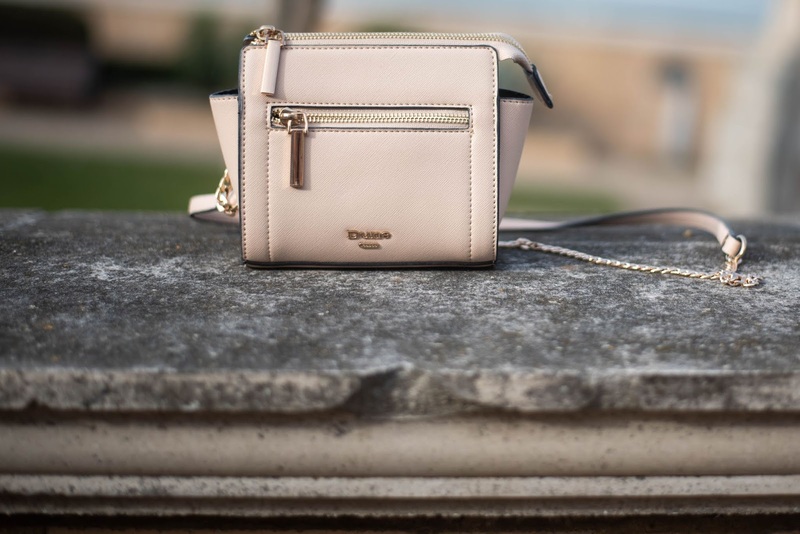 Love that cute little purse. Awww, thanks for the shoutout Jacqui! And your photos are gorgeous as always. They are giving me the travel bug for sure. I love that your family gathers to remember your MIL that is a sweet idea. Also, I need to leave my closet door open more so I can gain more inspiration this way. Yours turned out fabulously...colors, prints and textures. thanks again and have a fabulous day! That's the best way to put together outfits, Jacqui. It's like the closet was doing all the work, LOL!! And what a fabulous outfit it is! As you can see I love pencil skirts too. What a good idea to remember your mother in law like that. It s good to share memories with each other. I think I have to subscribe again as I don't get your emails! Fabulous outfit Jacqui - that skirt is fantastic! That's a great pencil skirt! The outfit came together beautifully! Love the ruffles and animal print. Great outfit! Love when we find the perfect outfit in our closet. Jacqui, this is a fabulous combination. the blouse with the animal print skirt is gorgeous and the jacket complements it beautifully. 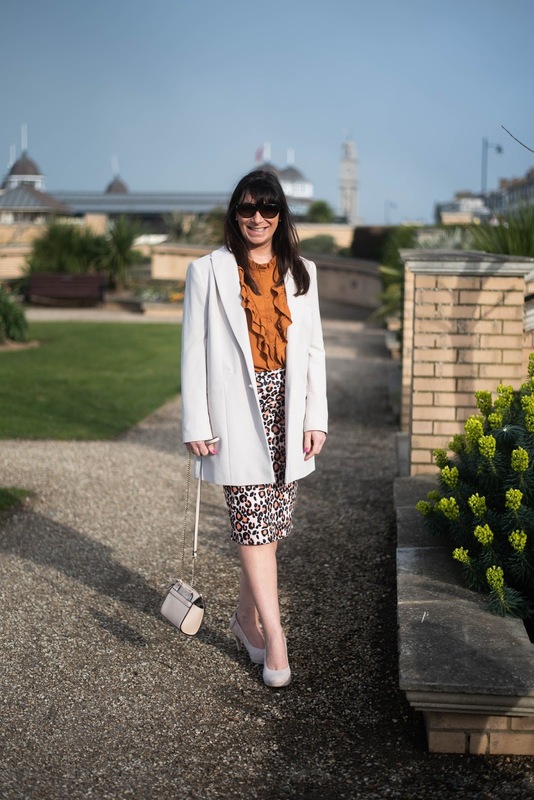 Jacqui, I love everything about this outfit, from the longline blazer to the leopard-print skirt. And aren't you just obsessed with Calla shoes? They are so comfortable and chic! Your pencil skirt is so chic! I love this entire outfit! The clothes must have wanted to be styled together! hehe. I love when that happens. No, i don't have doors on my closet, but the rack has almost come down! This is a beautiful ensemble Jacqui! and I do the same with my clocks. Enjoy your busy weekend! This outfit is SO cute!!! I love that skirt so much snd I'm really picky about my animal print lol! I love the longline blazer! And the color of your shirt is gorgeous! Great look! I love your white jacket! I love your leopard skirt!! Sounds like you have been busy! Have fun celebrating this weekend. You look beautiful. I do love the leopard skirt. I hope you're able to enjoy the life celebration this weekend! 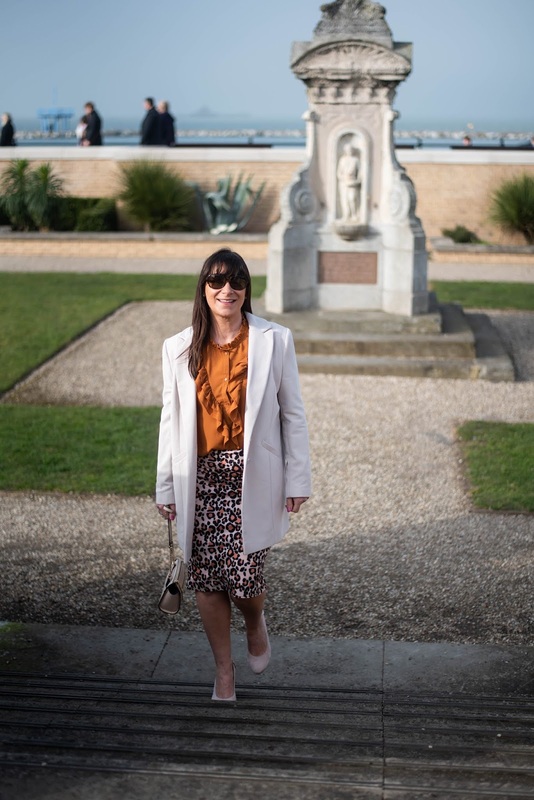 I love this outfit on you Jacqui and am taking some style inspiration from you on dressing up beige - my latest quest as you know! 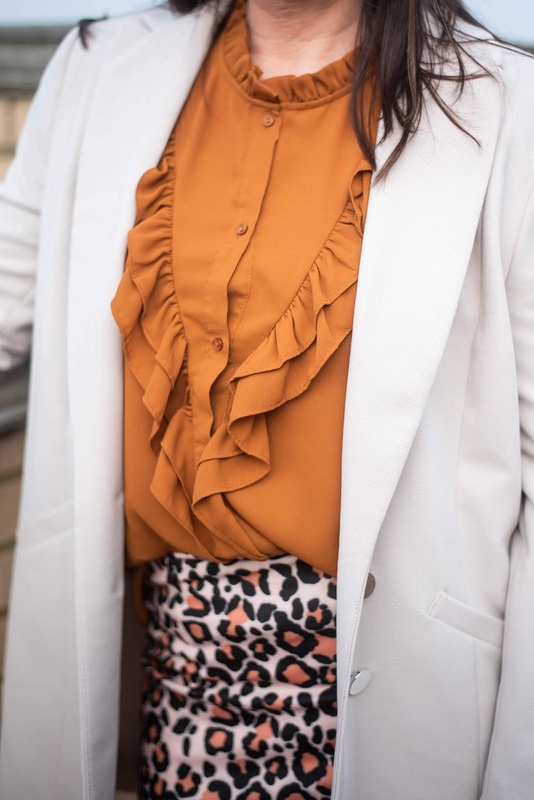 The animal print really jazzes up the neutral shades of your outfit and the mustard frilly top certainly takes it well out of the boring zone - well done! I love this outfit so much! The ruffles + the leopard, so cute! This look is so chic and stylish! I adore that pencil skirt. Leopard is my fave print!